Looking at the MIT Simmons Hall, it reminds me of how every city’s skyline around the world looks almost magical at night. It’s a wicked view depicting the shades of light and darkness plastered on a mass of work as if to depict opaqueness and transparency. 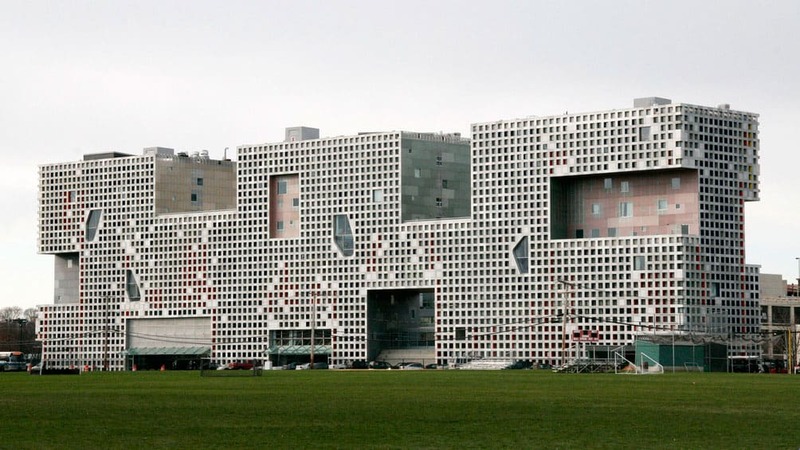 The Massachusetts Institute of Technology (MIT) had their goals set on a building that could become a source and space for interaction for students and staff when they commissioned Steven Holl to design this dormitory in 1999. Housing 350 undergraduates, Steven Holl’s design is now an icon within the campus, visited by thousands of architects and architecture students every year. Architect Steven Holl wanted a building inspired by a sea sponge. He went out and got sea sponges for everyone who was working on the design in his office just so they could understand how sea sponges function. Some students in the campus describe the building as a ‘giant-thing that looks like it’s about to eat the football field’. However, the excitement of freshmen when they hear they are going to be living in this dormitory is usually immense. ‘Porosity’ was the goal of the architects. Following the organic workings of a sea sponge, that was achieved. To reach the goals of MIT of designing a building that fosters interaction, the architects provided a 125-seat theater spanning two-stories, dozens of lounges scattered through the building, a night cafe, and street level dining to complement the 350 undergraduate rooms. These common spaces are where students meet to chat up and hold discussions through their campus life. The building has five large openings easily countable from one elevation. These openings double up as main entrances, view corridors and outdoor activity terraces. Inside the spaces, you notice large dynamic openings that are responsible for bringing natural light down into the spaces while moving air up and out. The architects refer to these volcano-shaped openings as the building’s lungs; and they can be seen predominantly in the lounges. Each room in Simmons Hall has nine operable windows each with its own in-built curtain. Each window provides a fractured view of the city and every night as some students pull their curtains to shut the windows, a skyline is depicted on these facades, with some areas dark from shut windows and others bright from the lighting in the rooms. While some students have complained about having to spend five minutes every evening closing nine curtains, others have talked about the furniture you cannot move more than once a year. The rooms have furniture that is fixated on specific positions, the student gets to choose the positions at the beginning of the year when they move in. As they enjoy living in the sponge, one painstaking question that keeps bothering them is; why can’t I move my furniture whenever I want, wherever I want? The 10-stories-tall building is not new to awards. In fact, it’s received a couple courtesy of its looks, functionality and energy efficiency. A 450-millimetre wall depth allows the winter sun to warm up the rooms, while during the summer, it shades the building keeping the rooms cool to enhance living. The volcano-shaped openings in section that act as the building’s lungs together with the exterior rigidity of the facade gives this building a metaphorical sea sponge functionality. It didn’t come cheap, however, because the Simmons Hall is now considered the most expensive dormitory in the United States, costing upto $78.5 million.